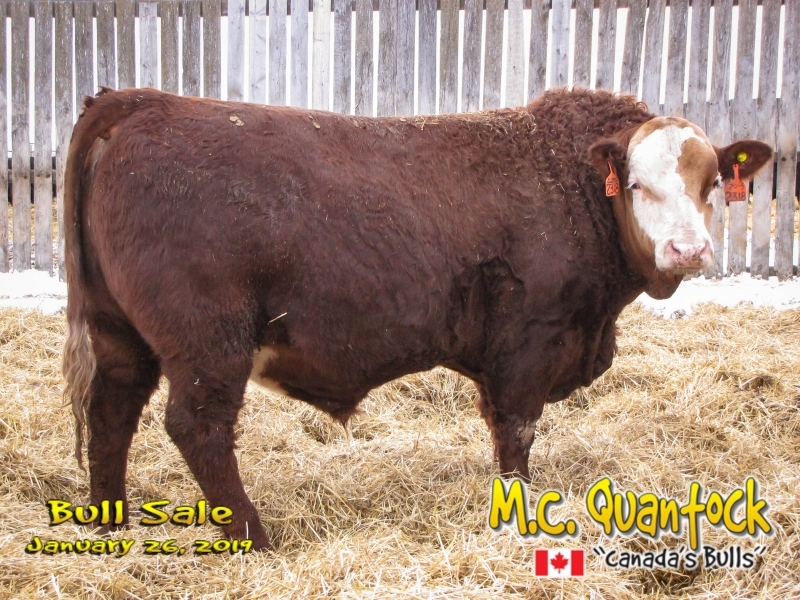 Easy fleshing, broad and thick. 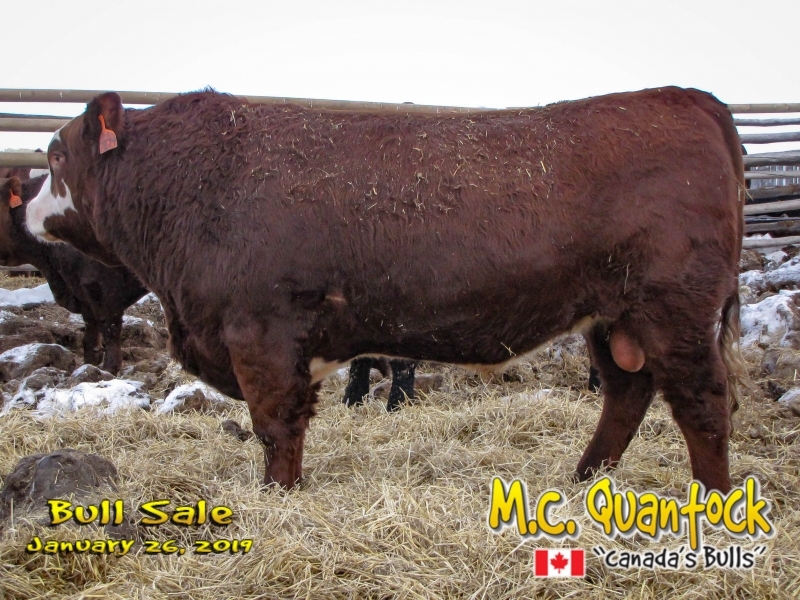 We’ve harnessed the best of both breeds. 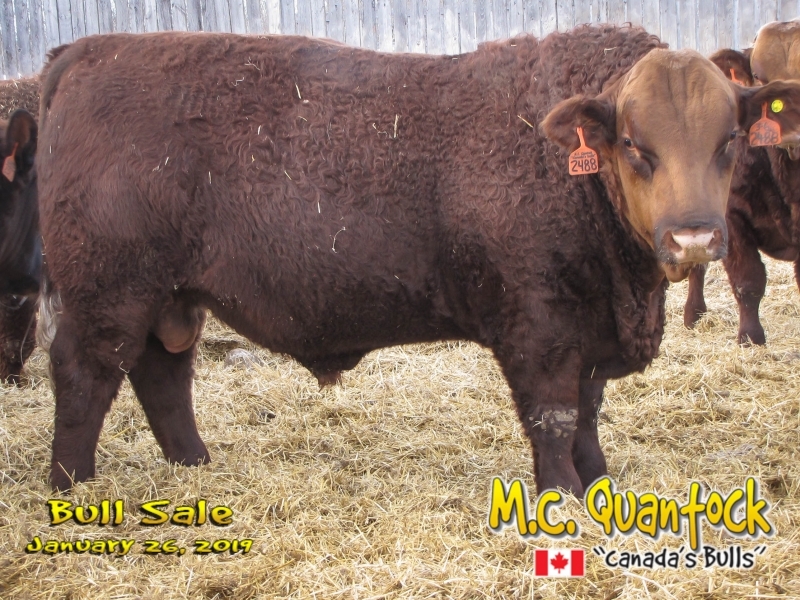 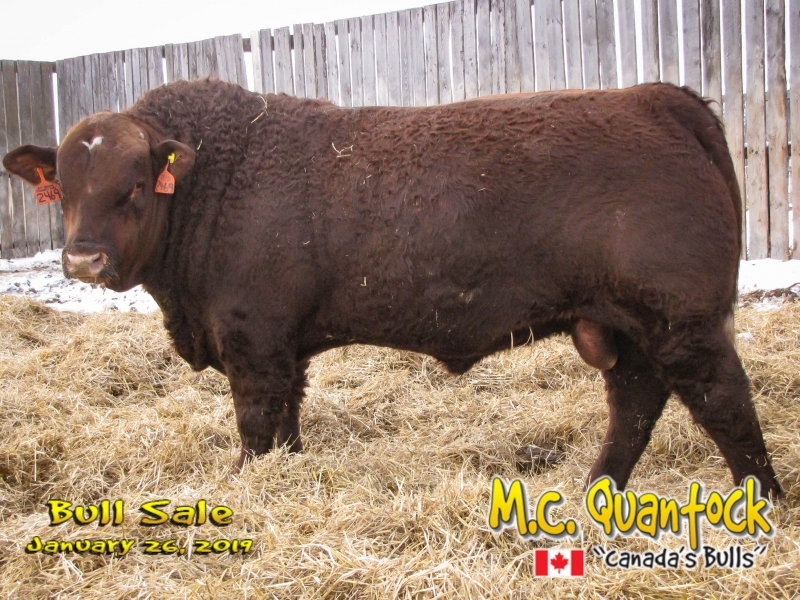 Incredibly beefy, thick bulls, they pack awesome payweight on disciplined moderate frames. 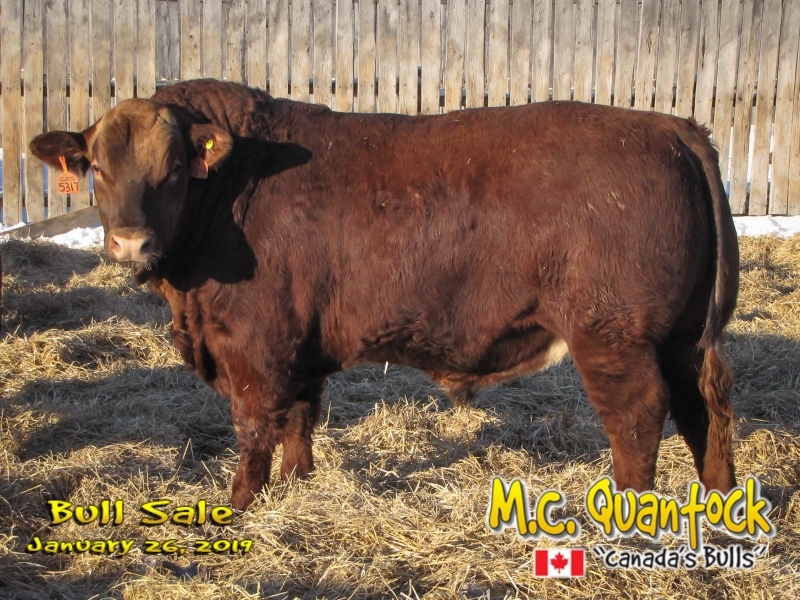 They have all the convenience of Red Angus; moderate consistent birthweights (85-95 lbs. 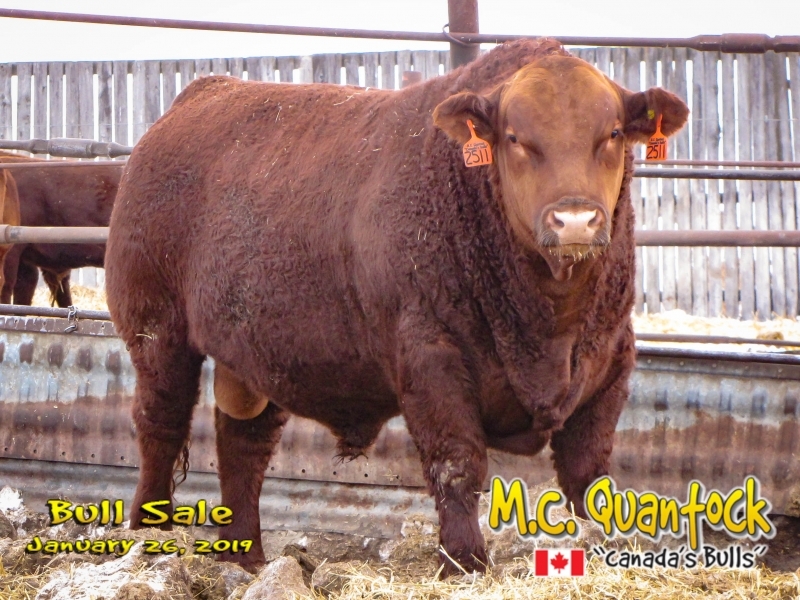 almost without exception), “easy fleshing” (they’ll hold their condition in the tough going) and on feed they’re “quick fleshers” with bold hybrid performance (4-5 lb. 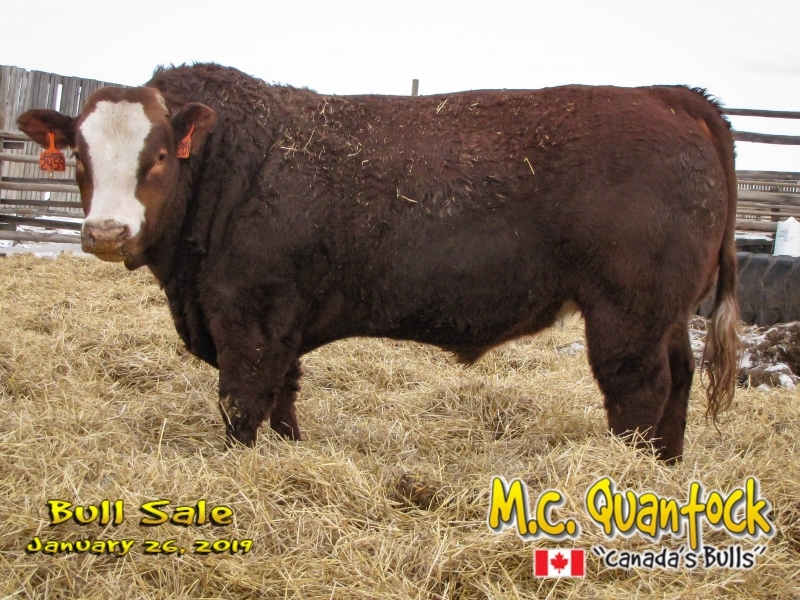 gains are common place). 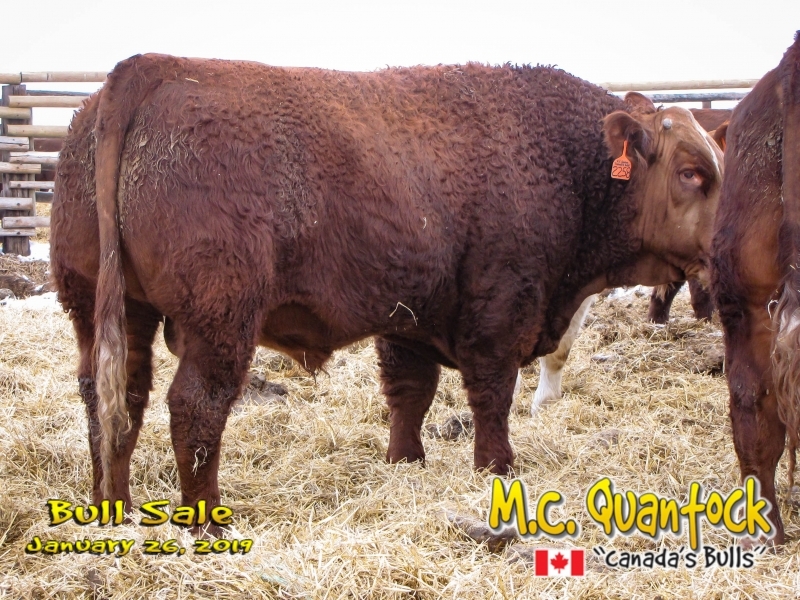 The Simmental blood gives them that essential “touch of continental muscle” you need today, as well as adding milk and growth to the blend. 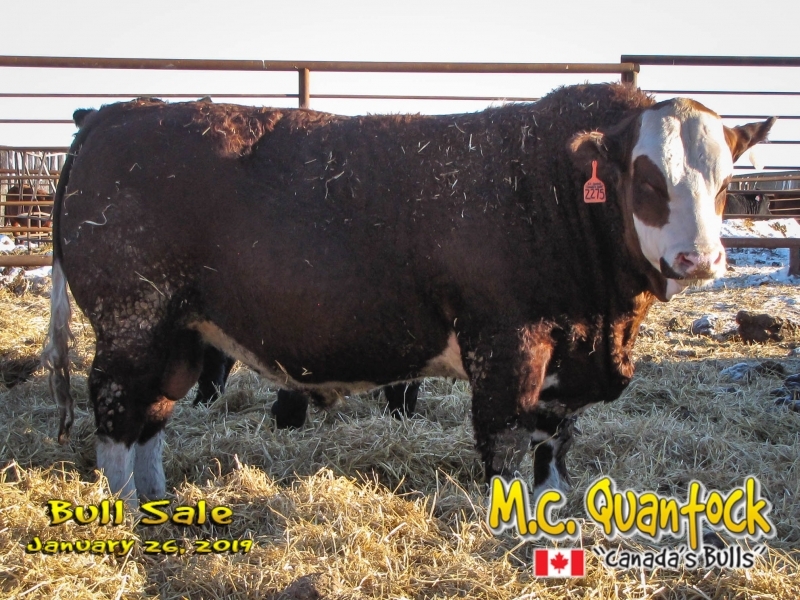 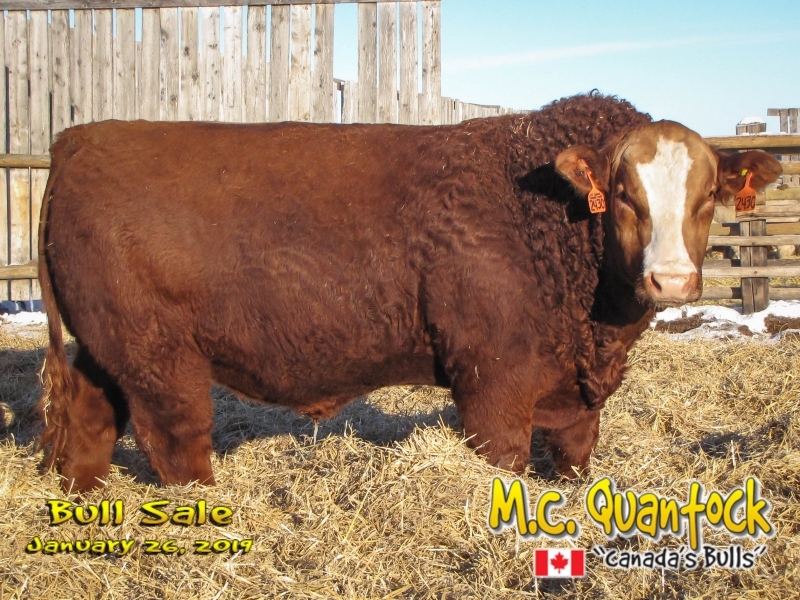 Our “Super Baldie Bulls” are an industry success story, over nearly 25 years. 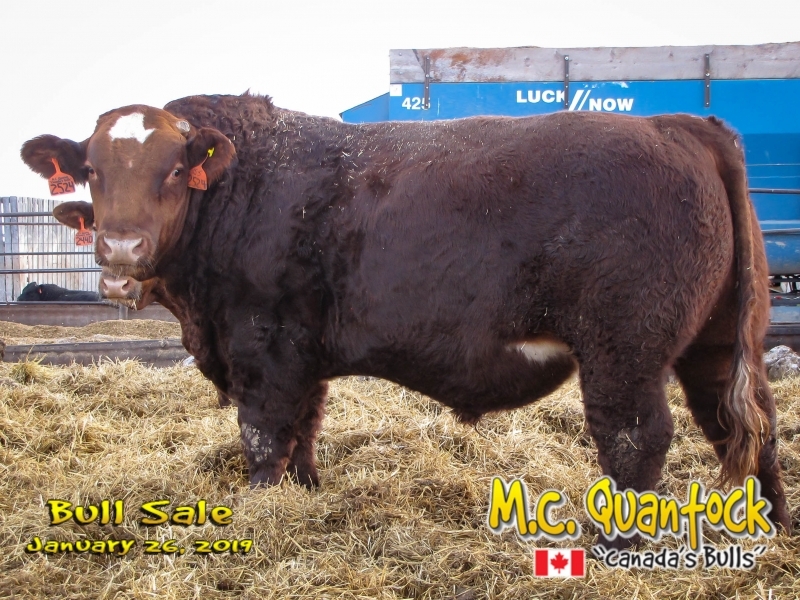 They add milk and muscle and are “right sized” to give you no calving problems or management nightmares. 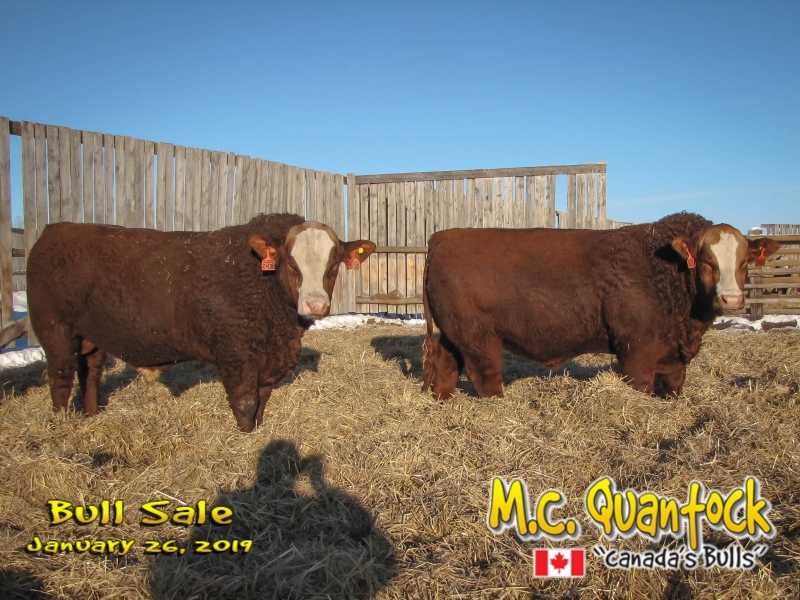 Best of all, they’ll give you Red Baldie females for replacements you’ll want and need to keep. 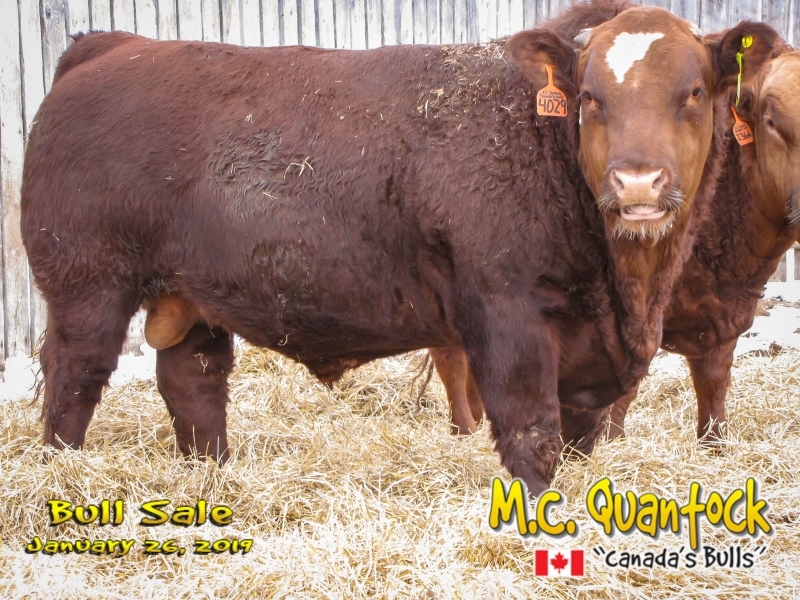 Too much exotic — they’ll beef ’em up. 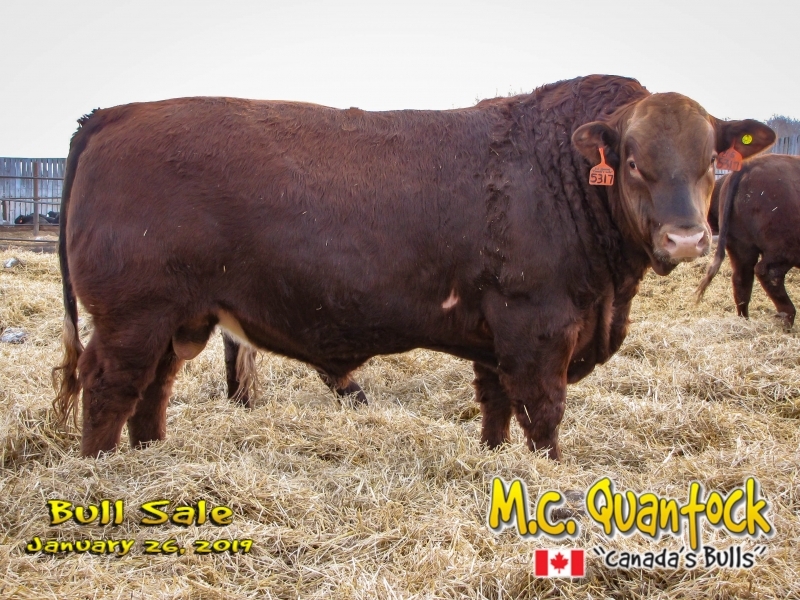 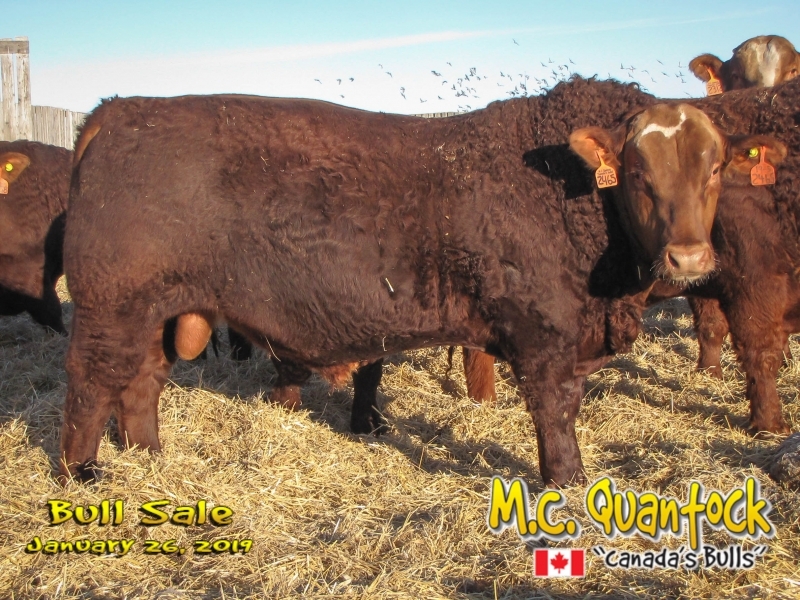 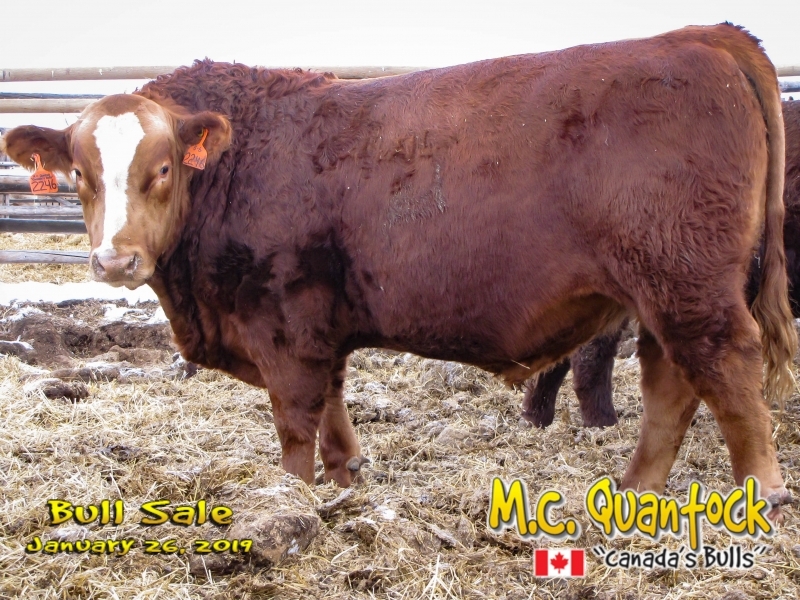 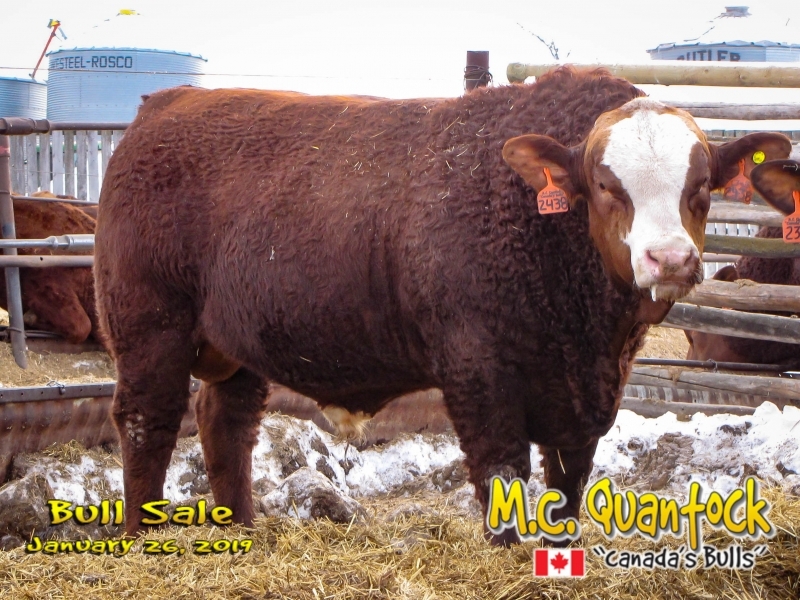 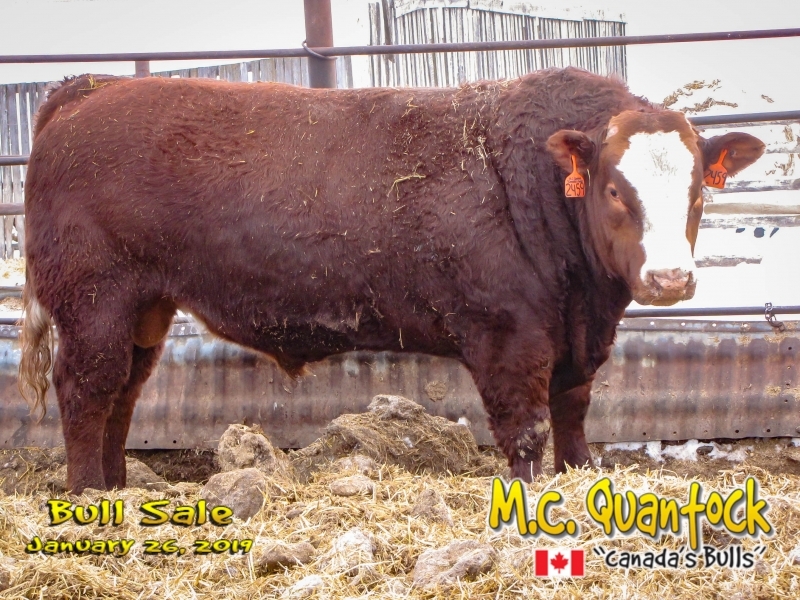 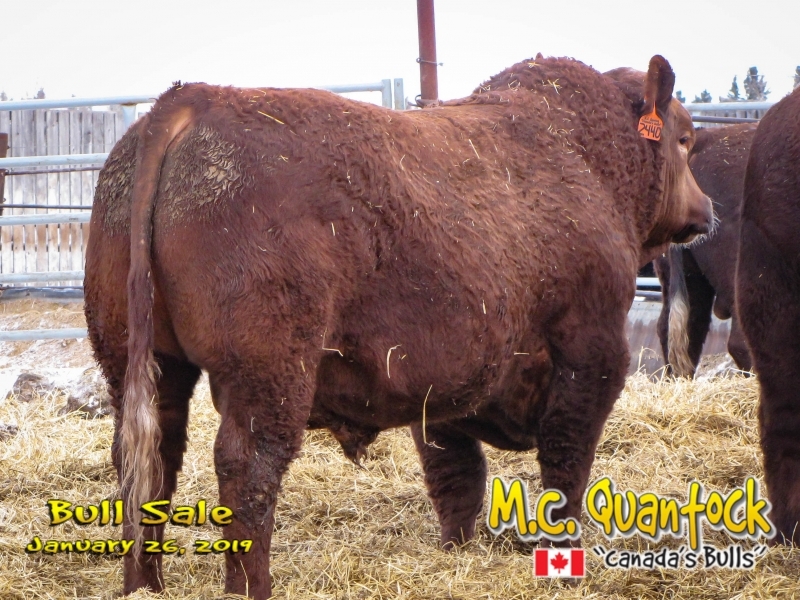 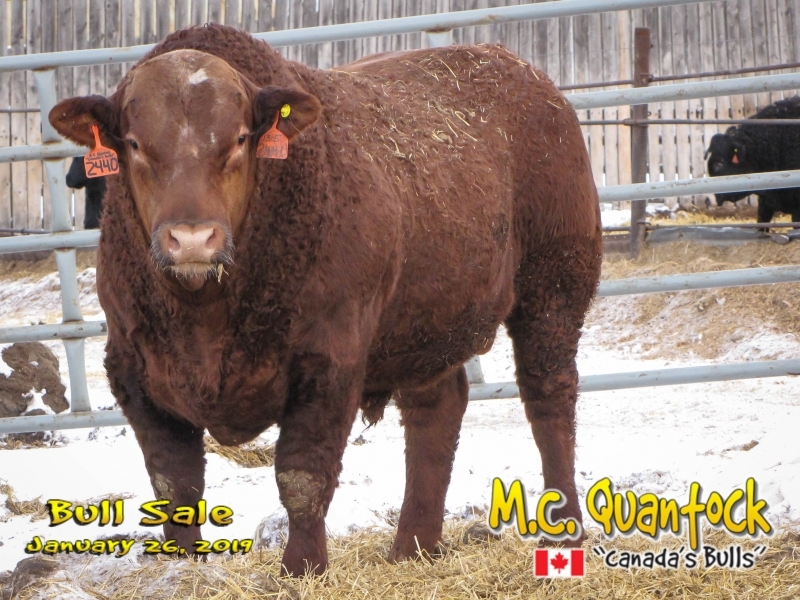 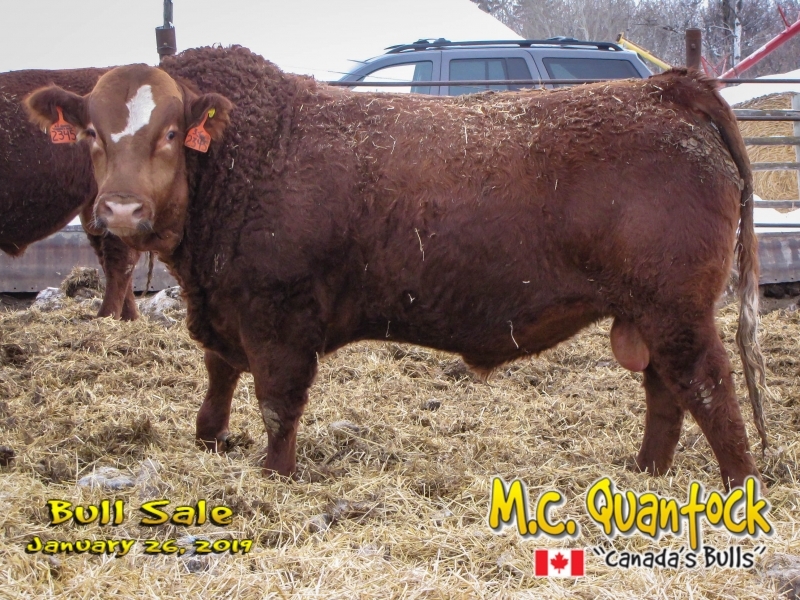 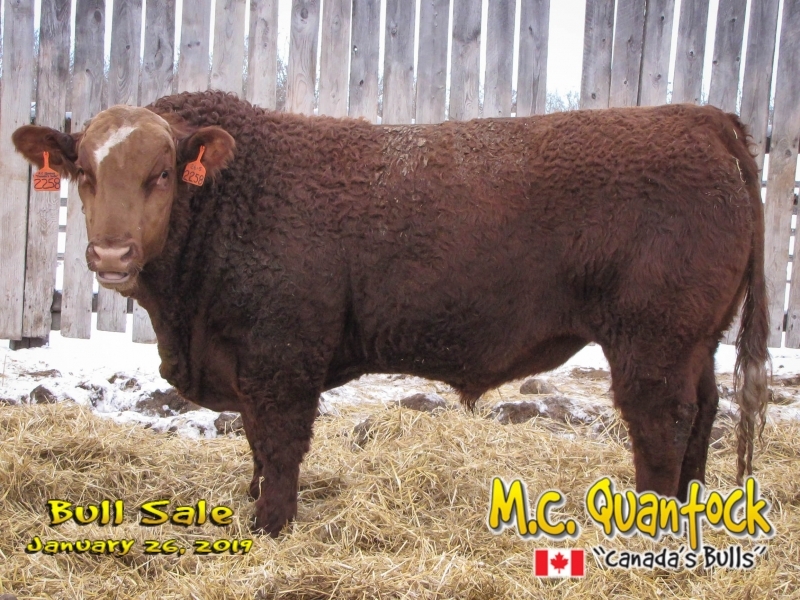 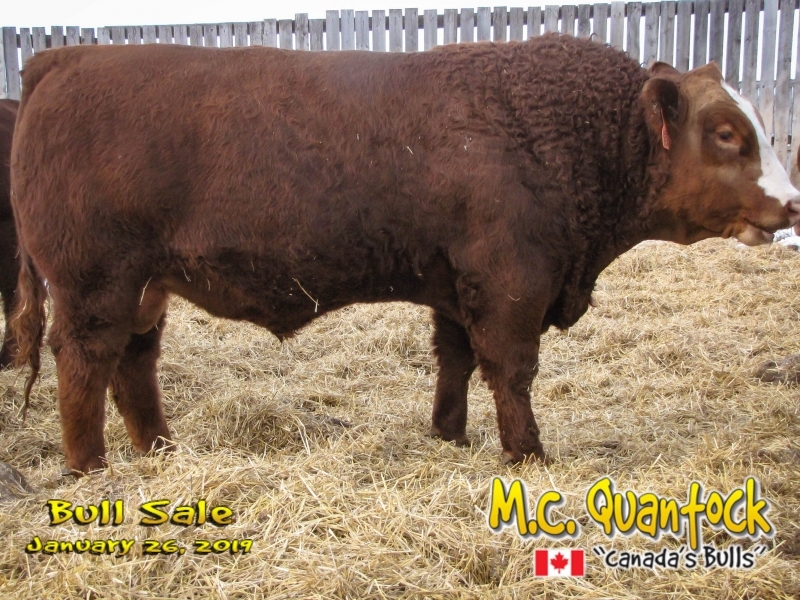 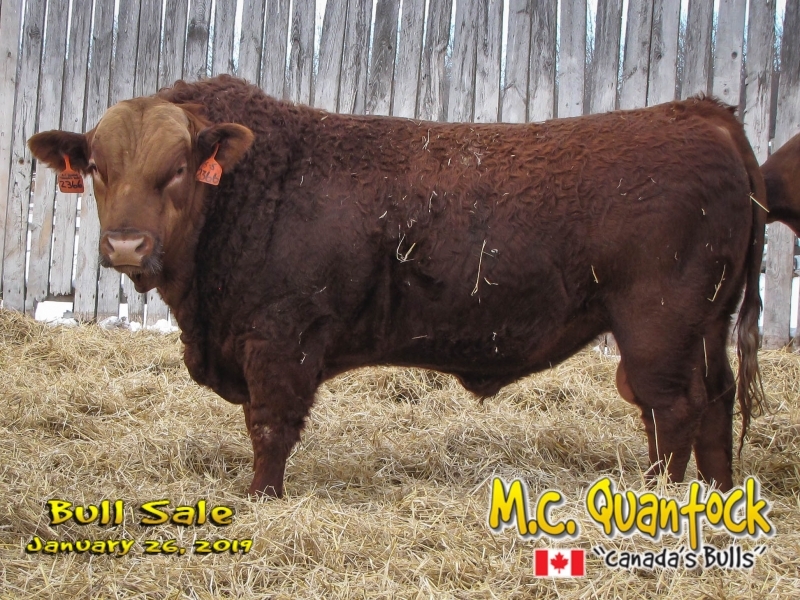 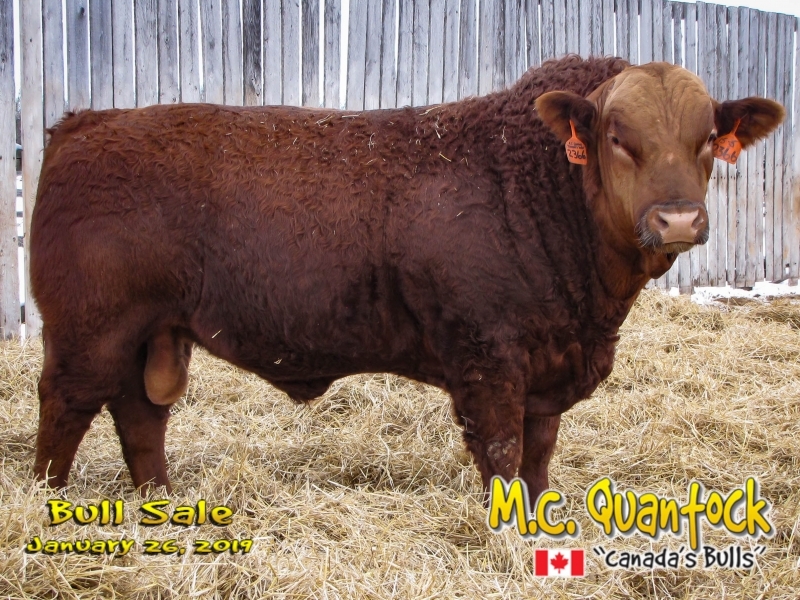 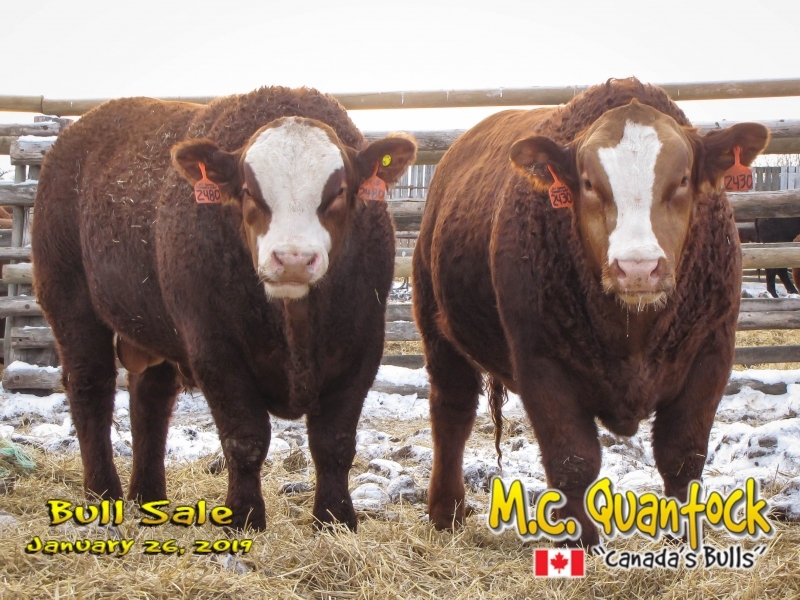 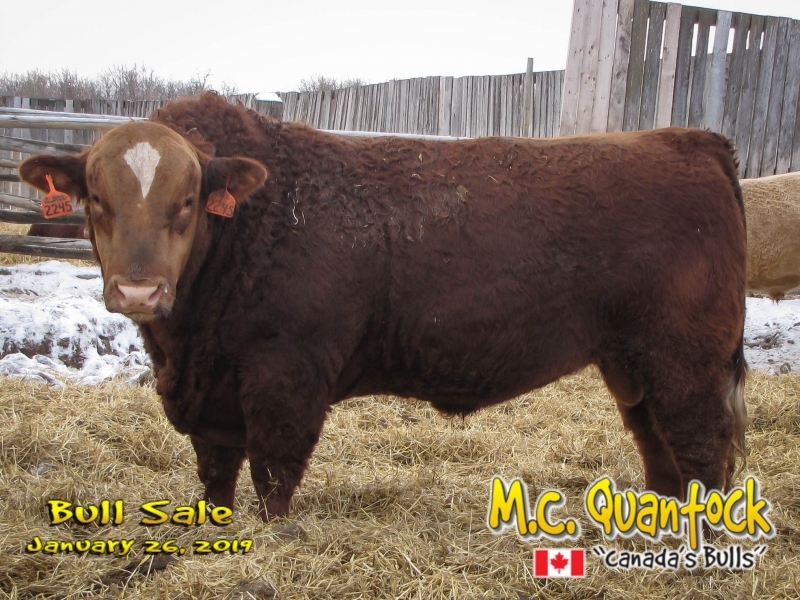 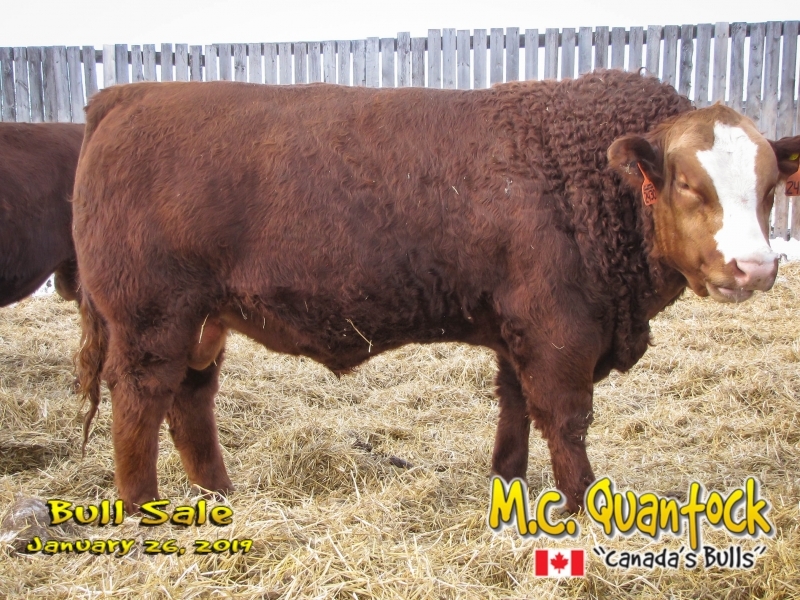 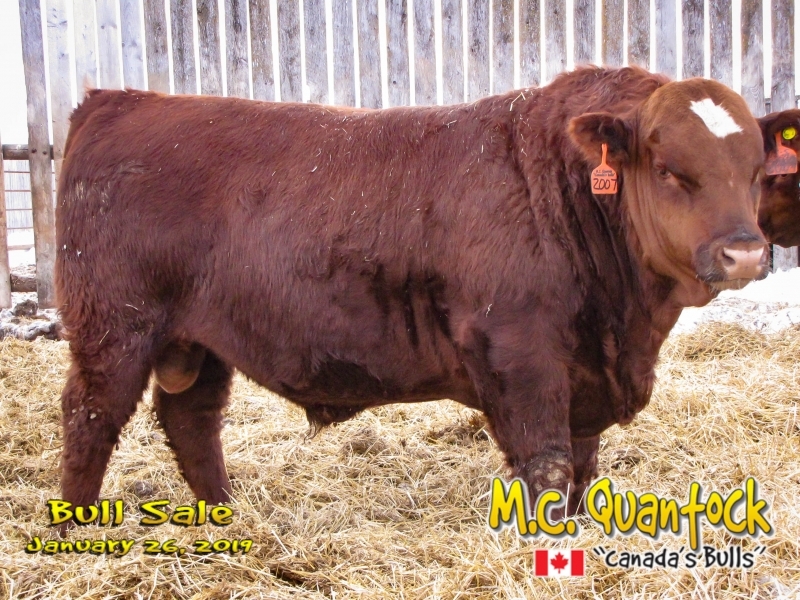 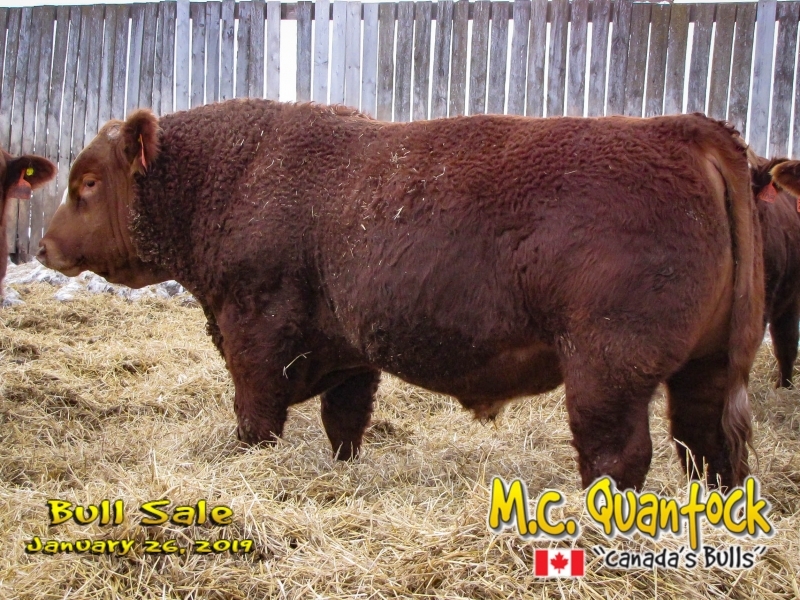 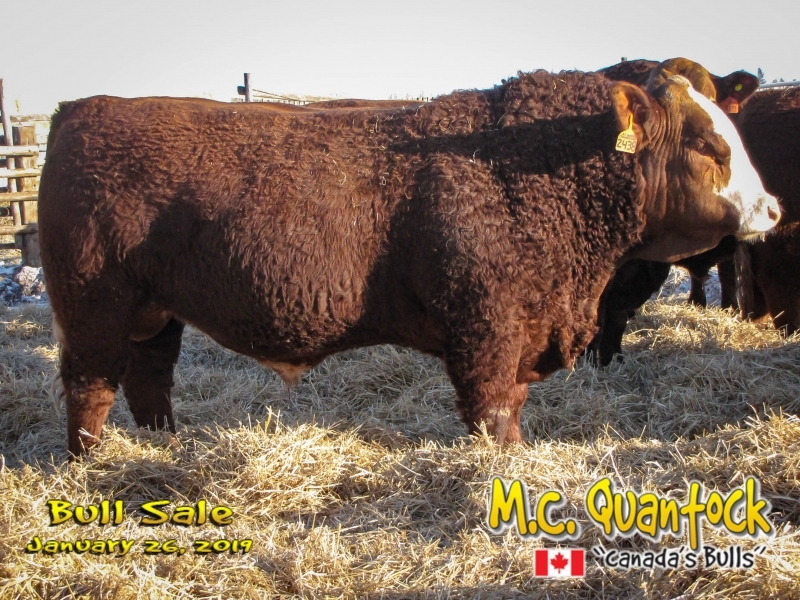 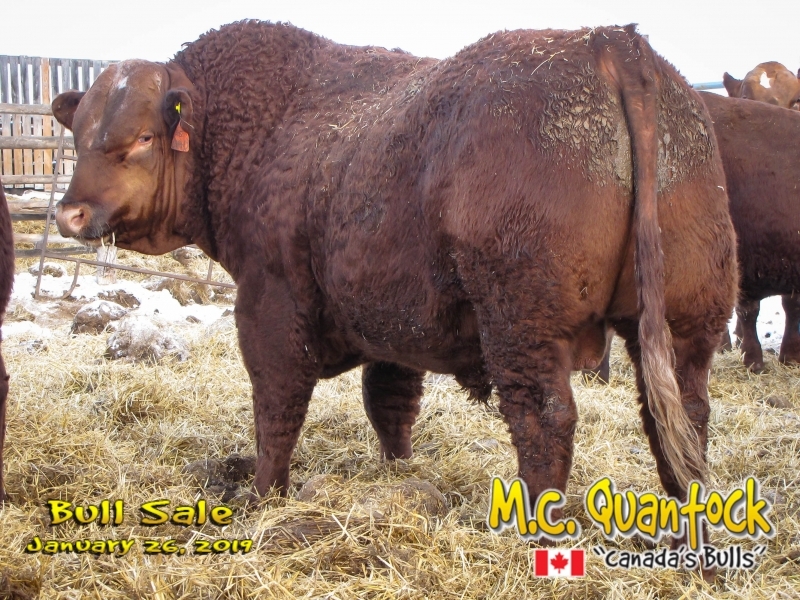 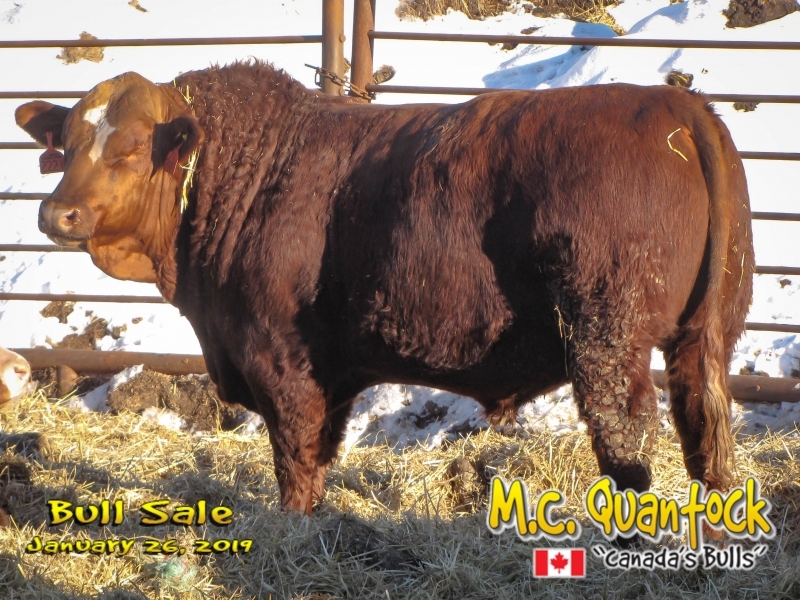 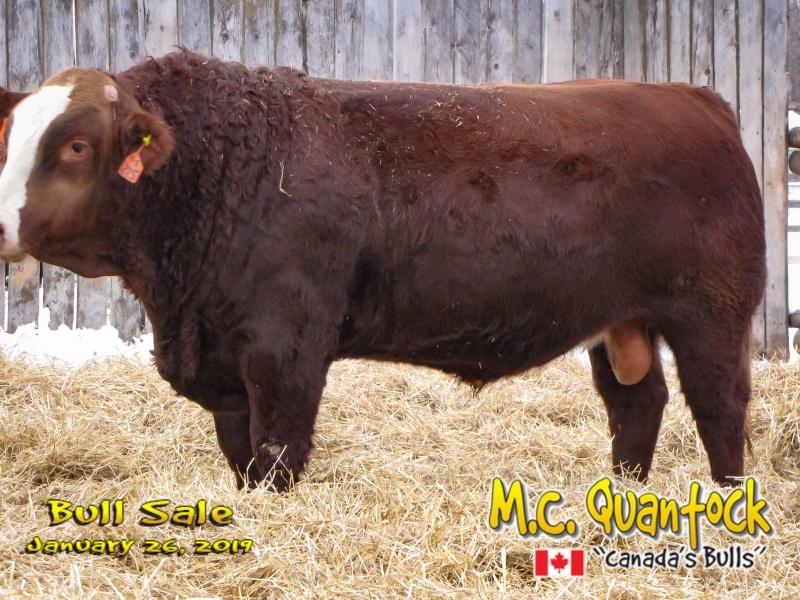 You can find a few Red Angus X Simmental bulls other places… but what you cannot find is the volume, uniformity, quality, and selection potential available from M.C. 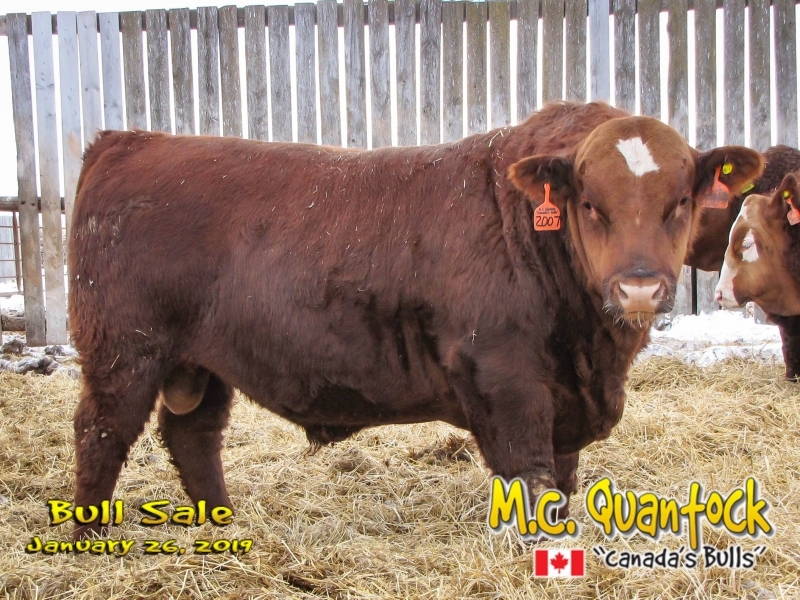 Quantock. 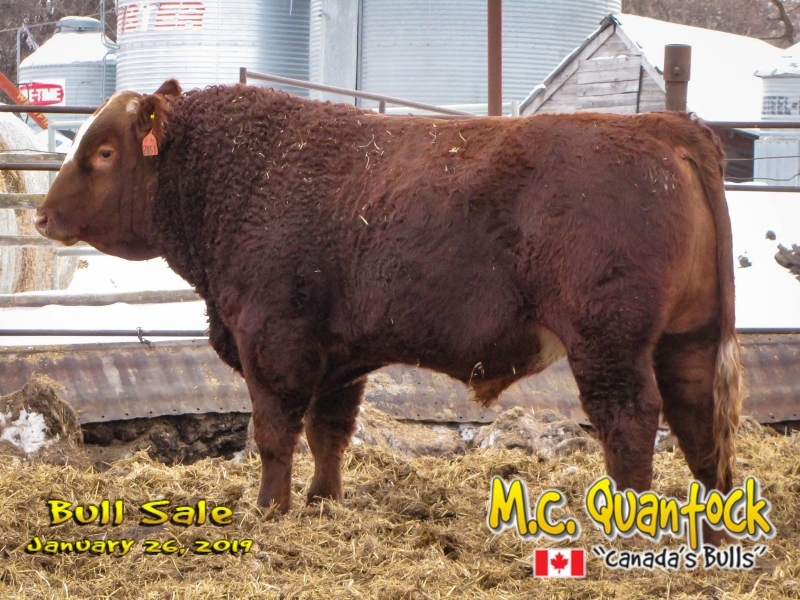 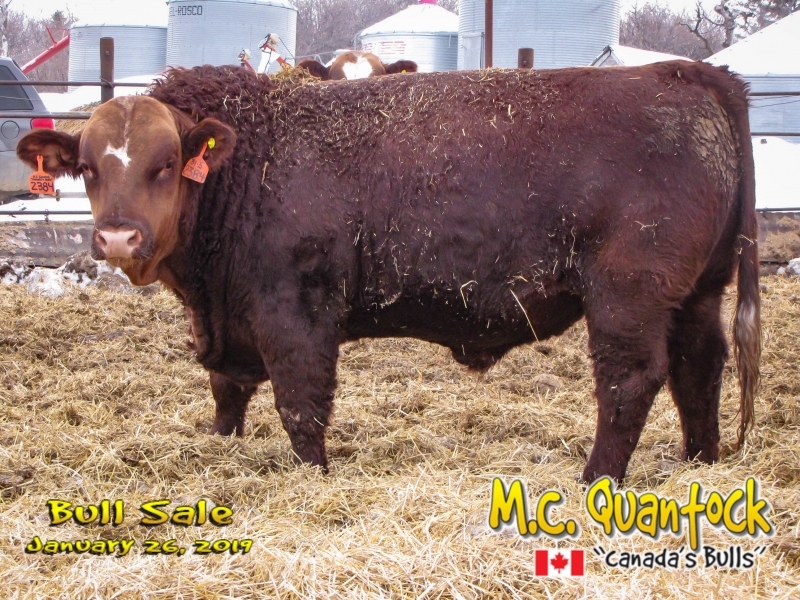 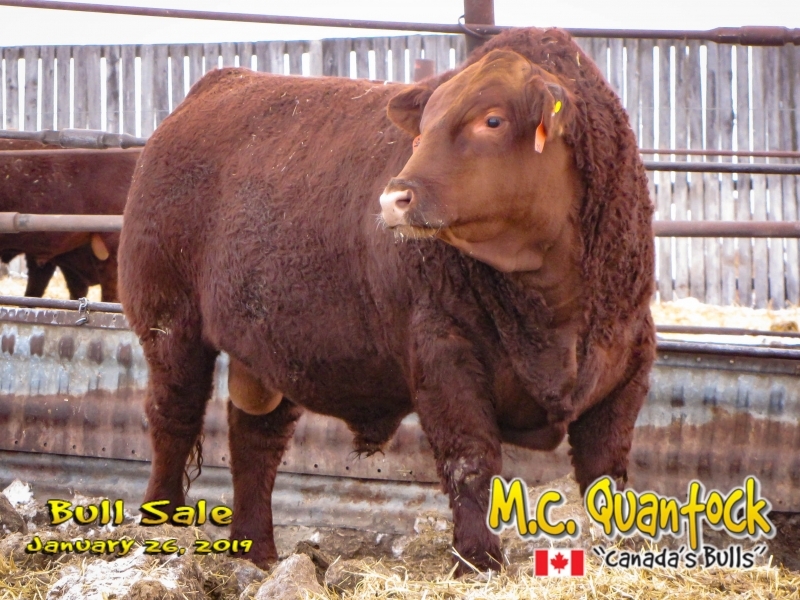 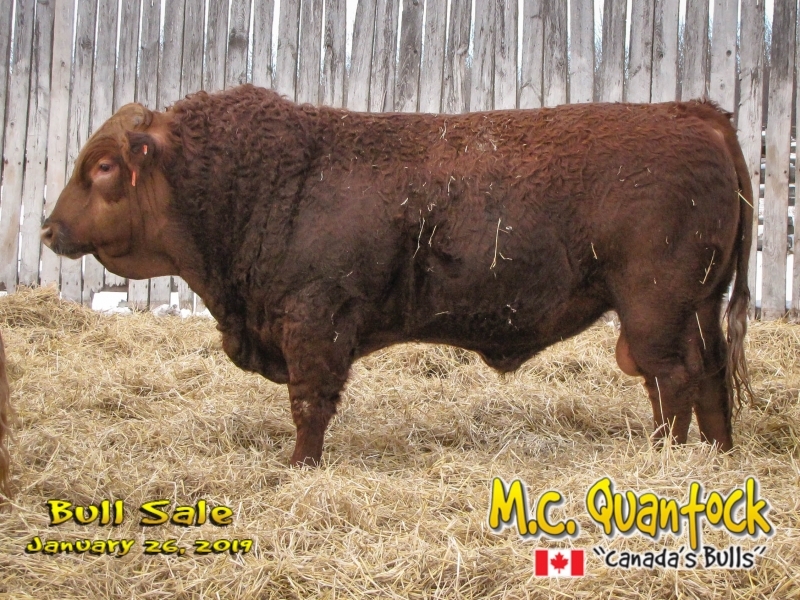 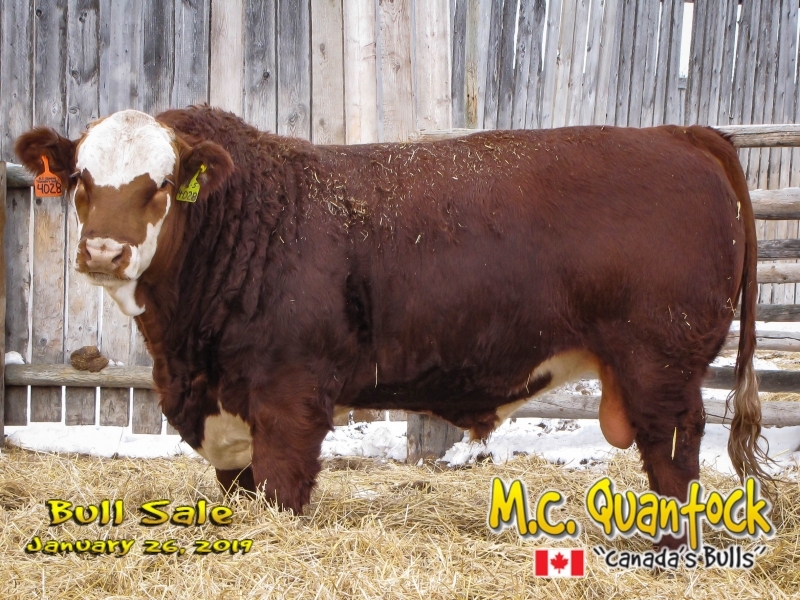 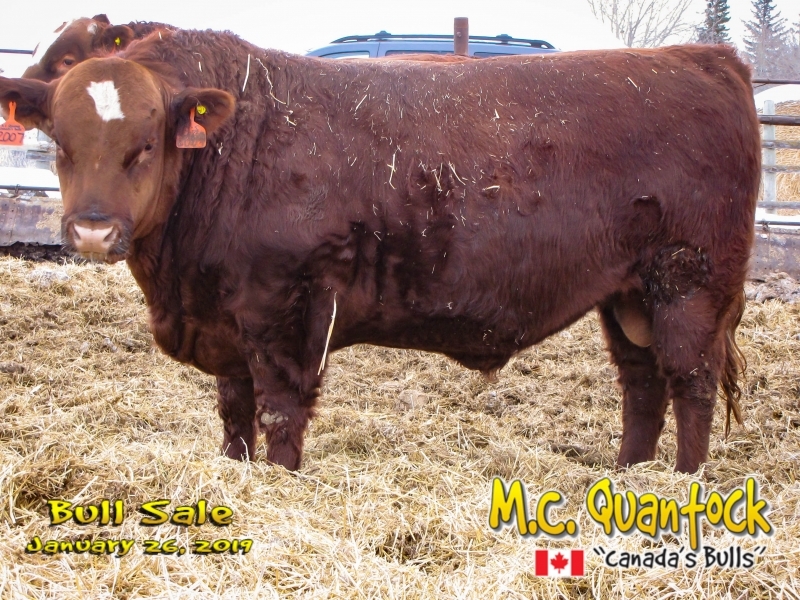 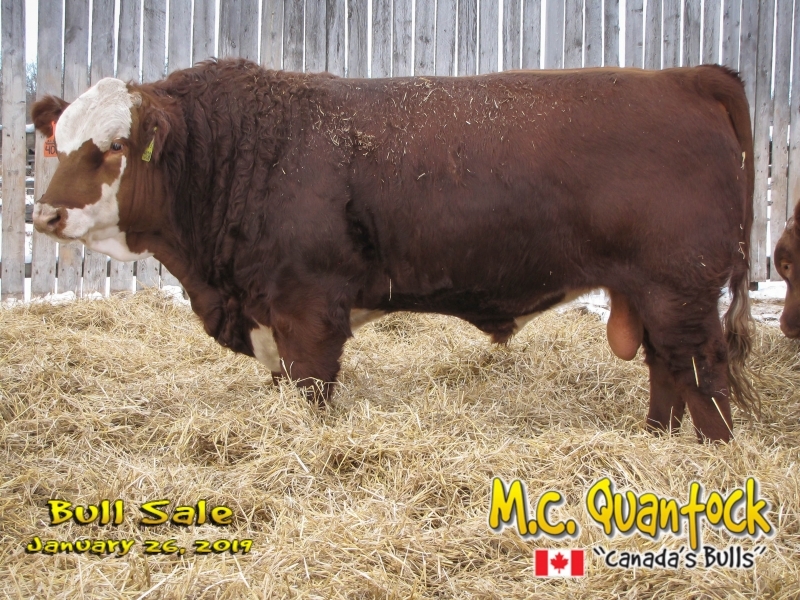 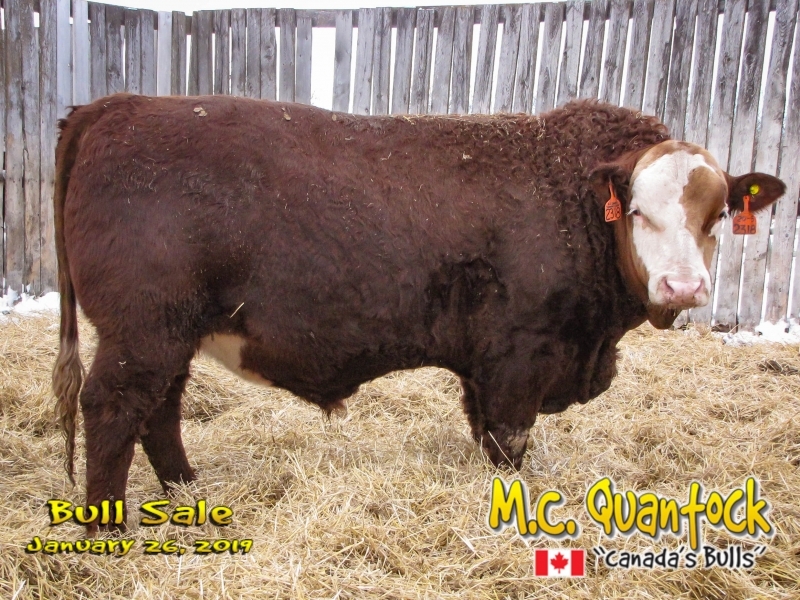 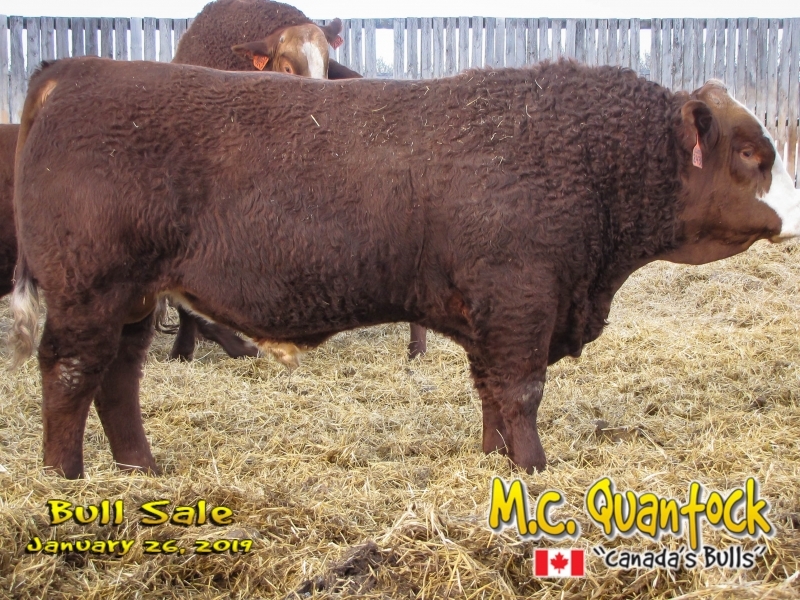 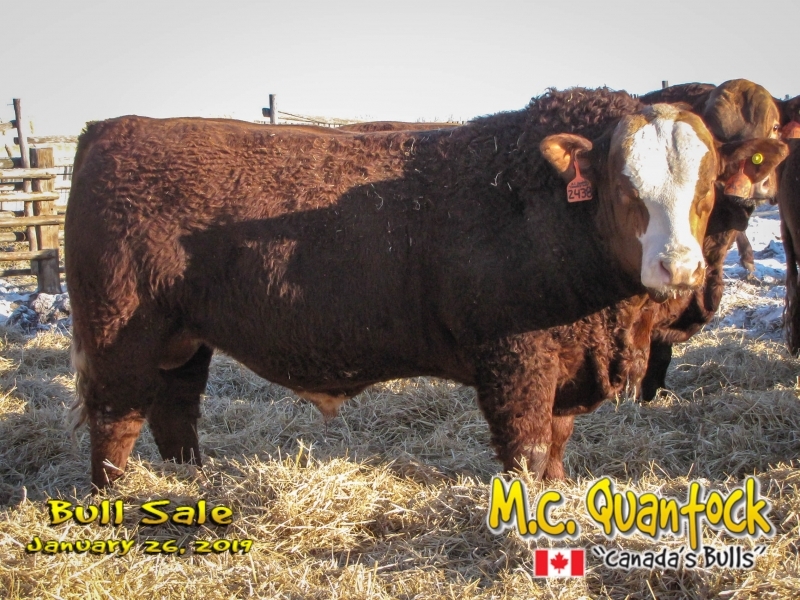 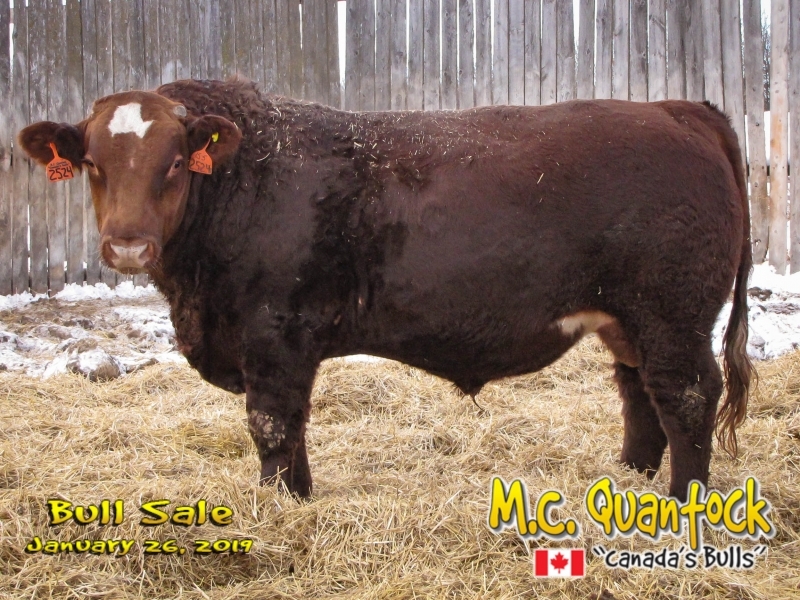 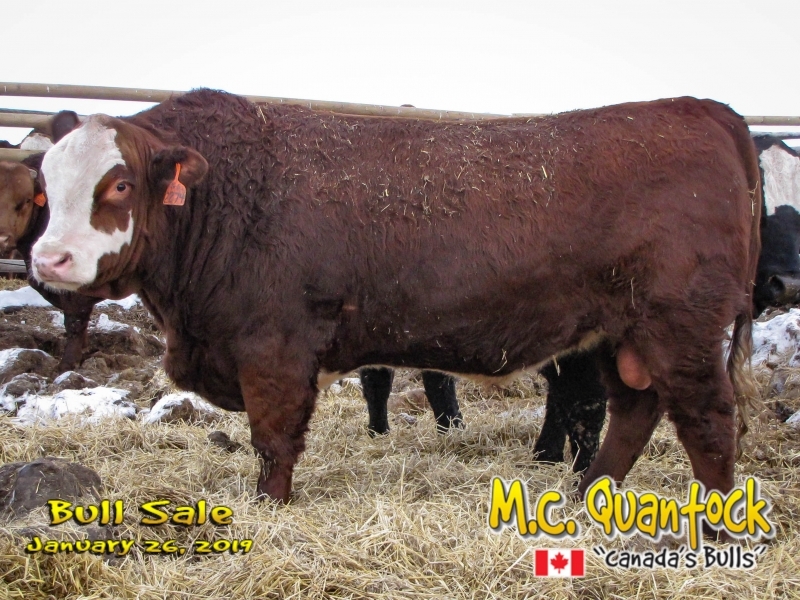 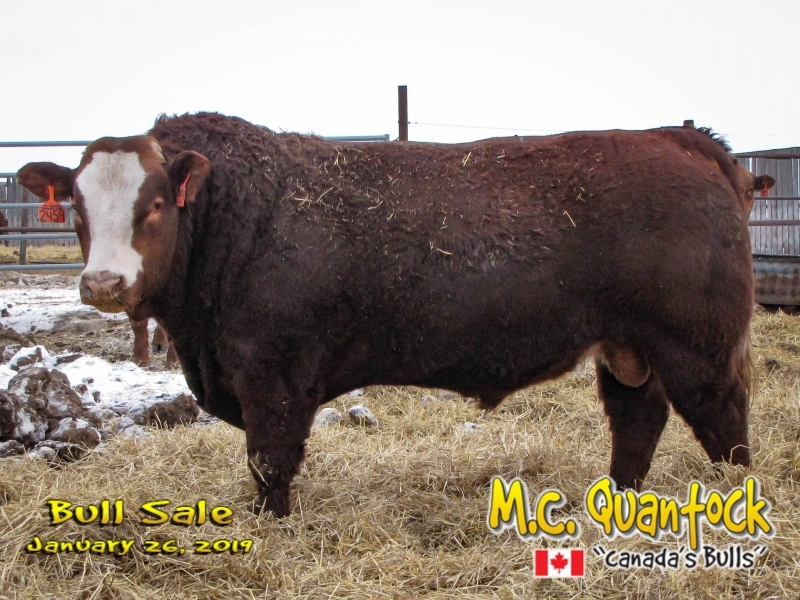 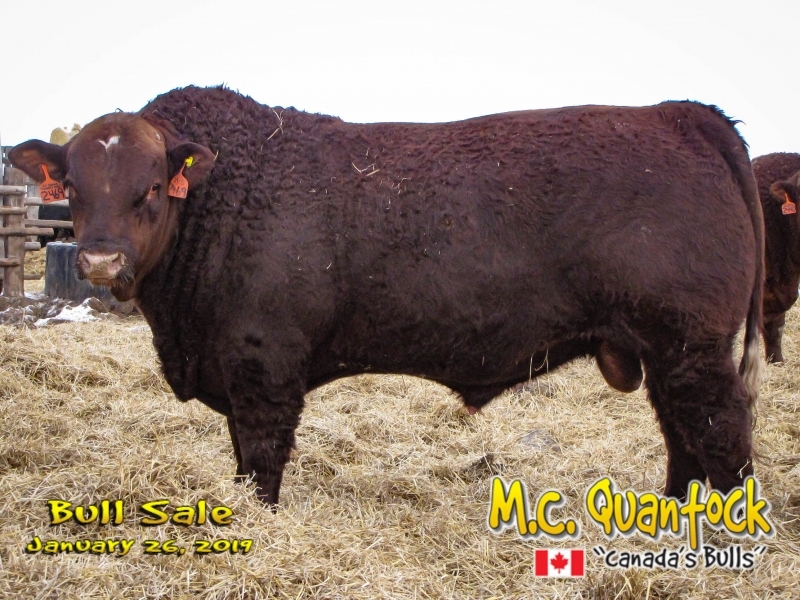 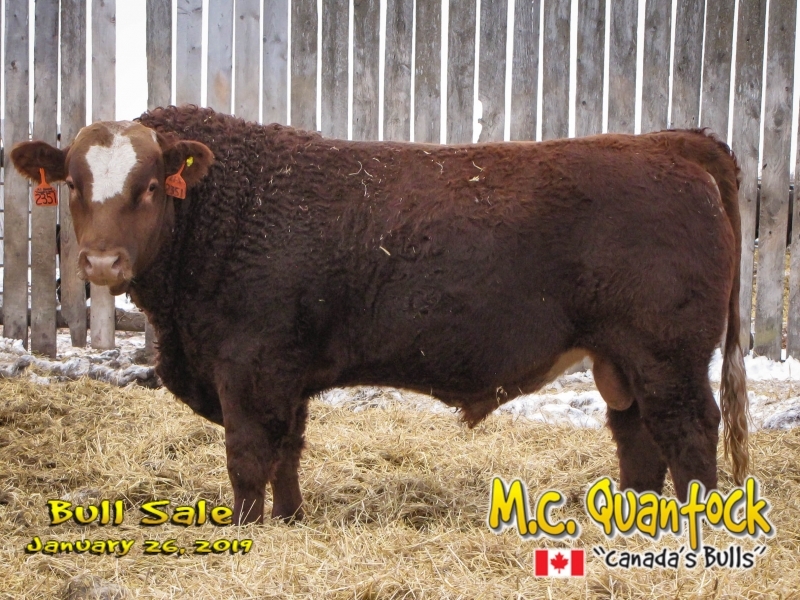 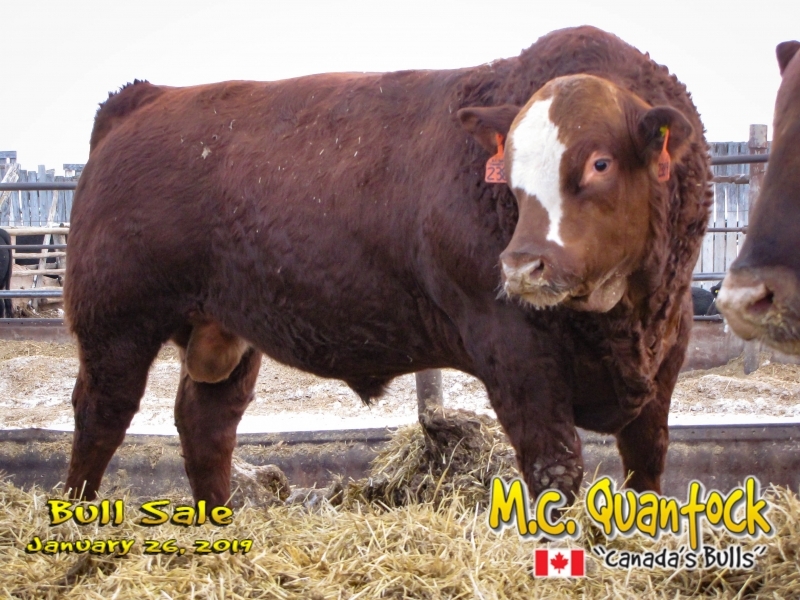 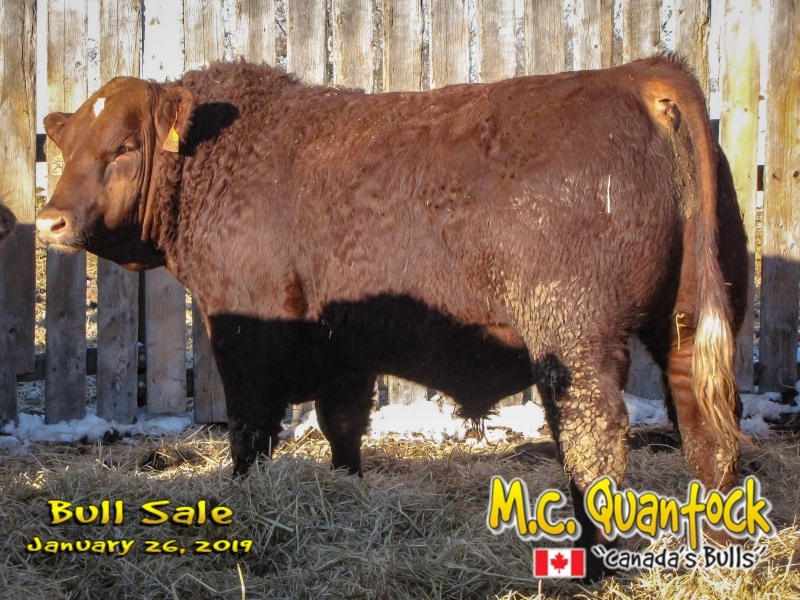 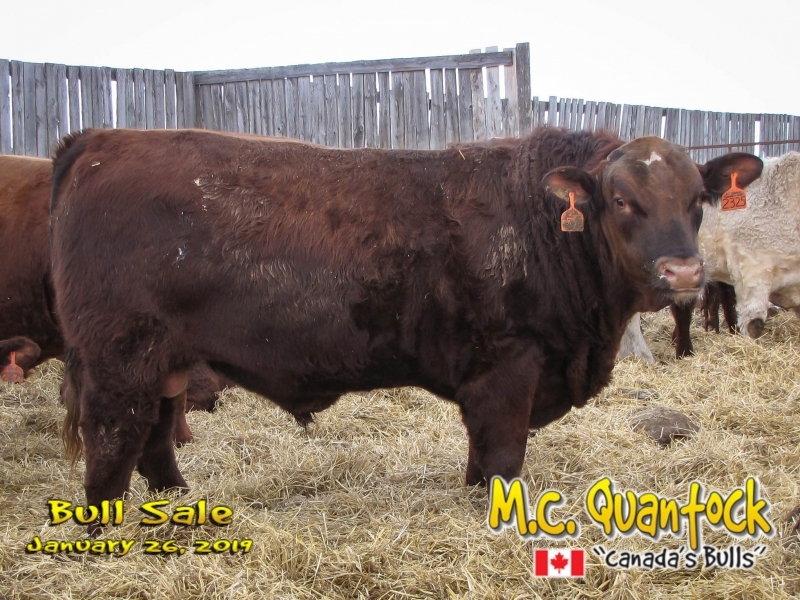 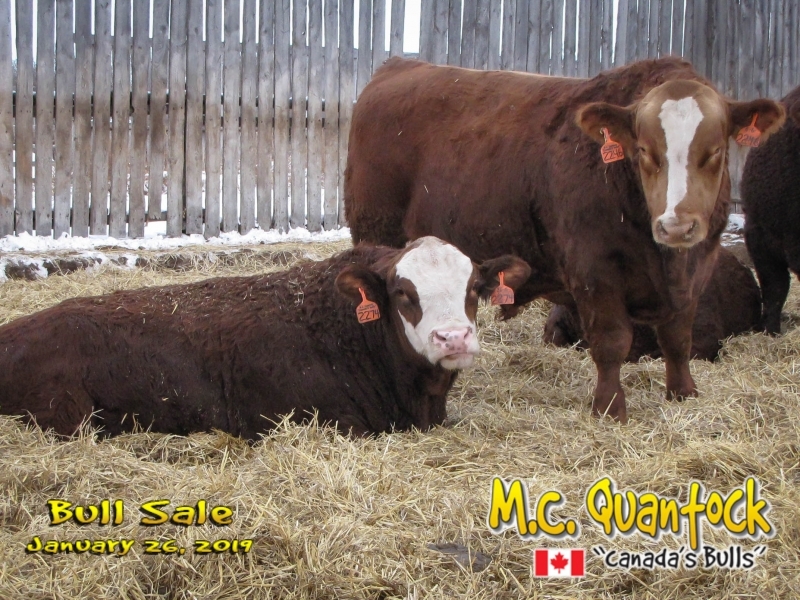 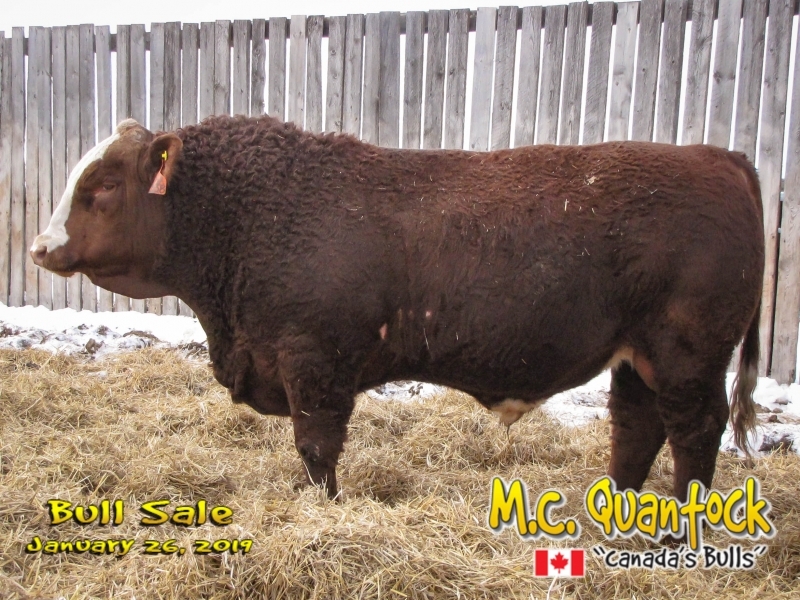 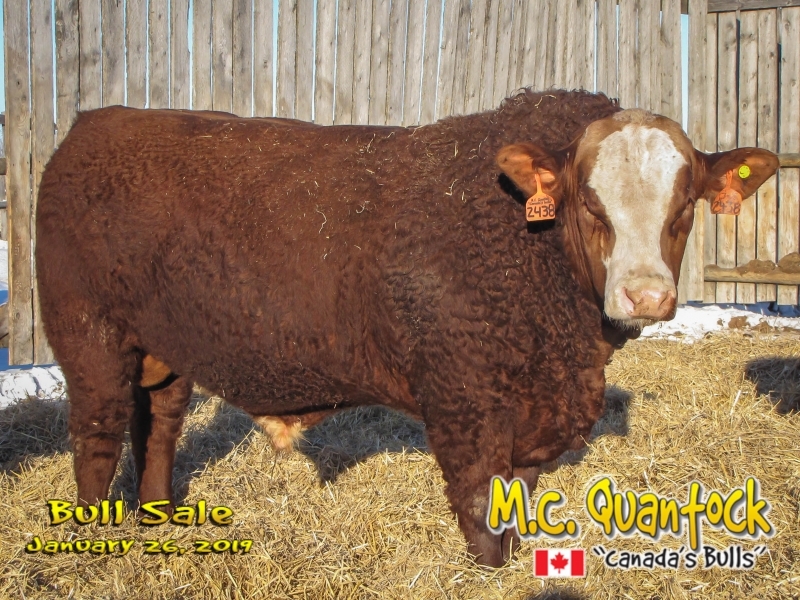 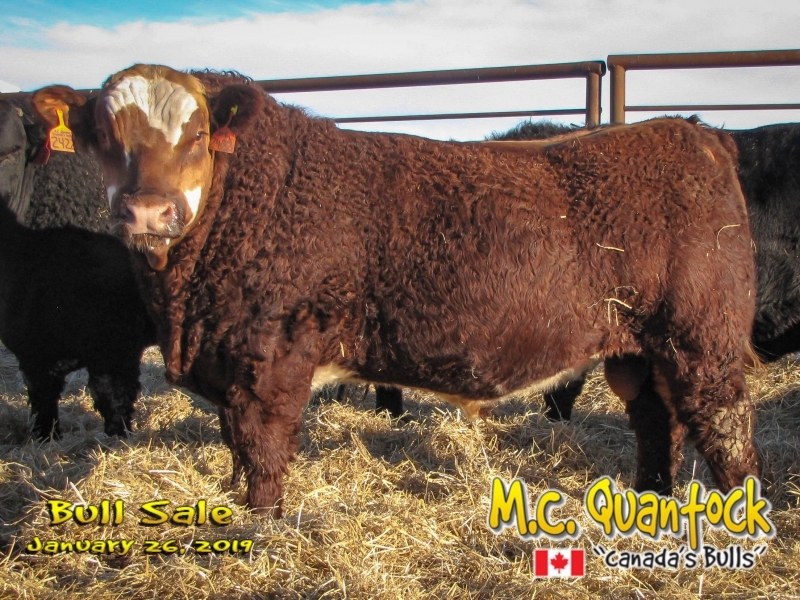 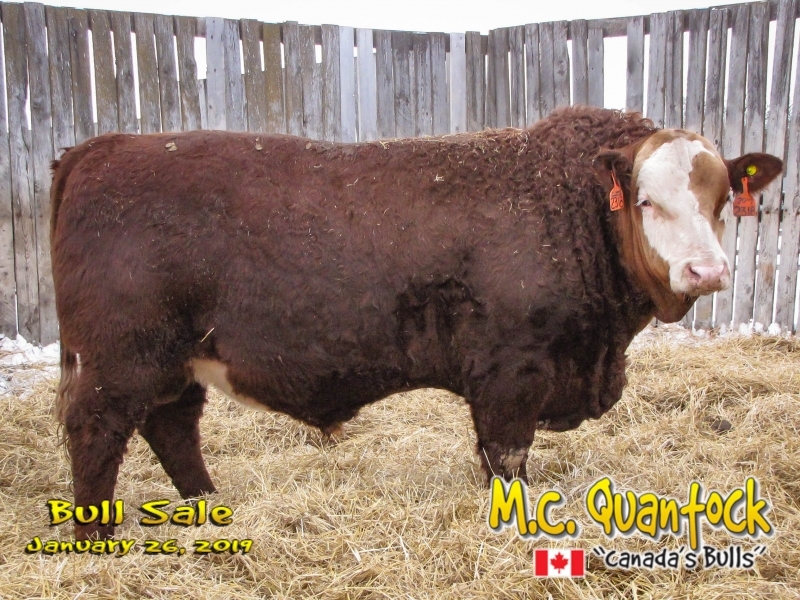 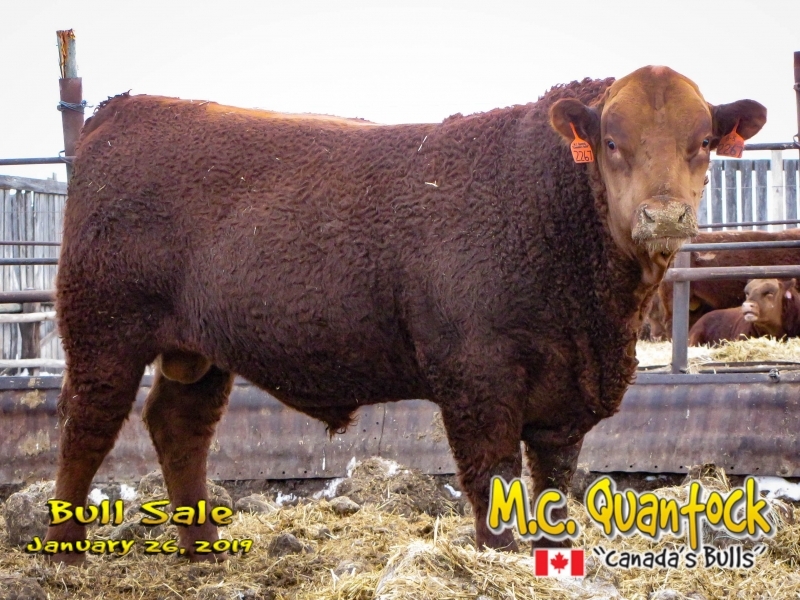 You can spend a lifetime infusing that blend of Red Angus Simmental or you can do it “one shot” using our Super Baldies. 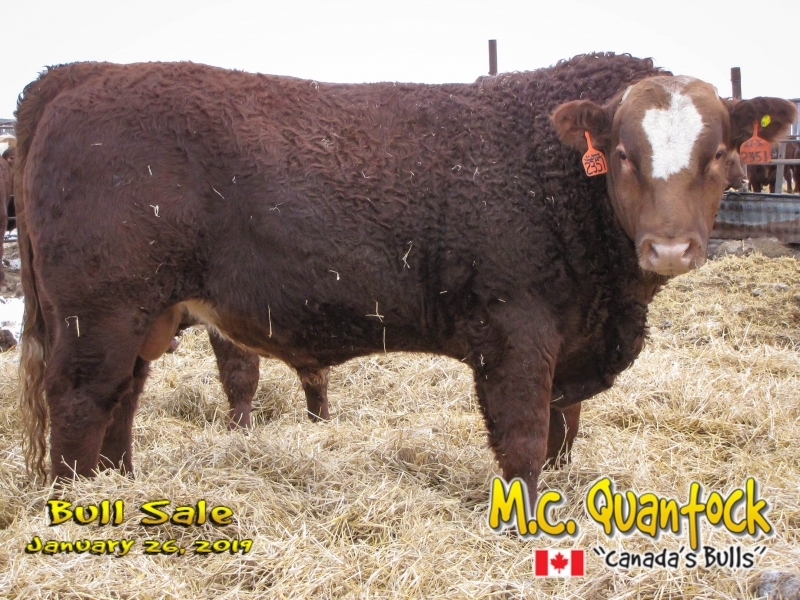 You’ll get beautiful “Angus Type” calves with “muscle and snap.” Your steers will top the market. 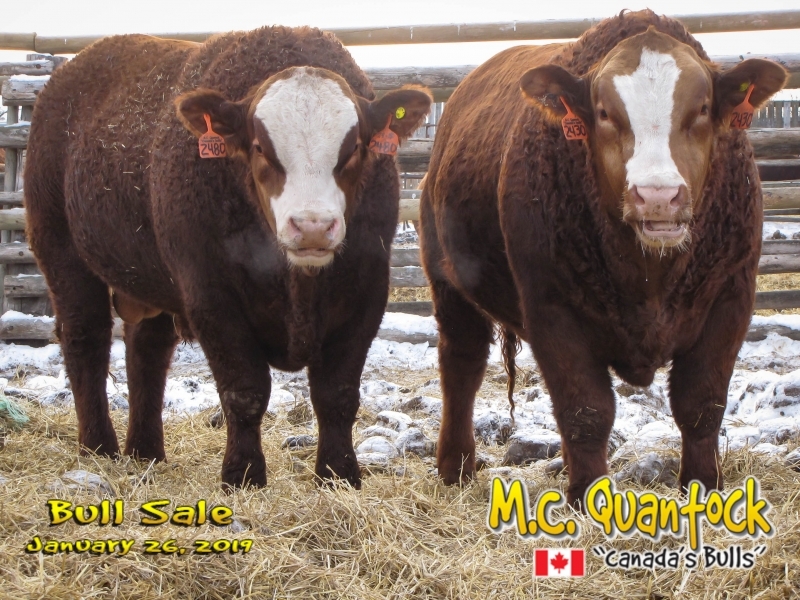 Your heifers will be the envy of your neighbours.